Hailed by BBC Music Magazine for his “handsome tone and laser-like tuning”, and acclaimed by audiences and critics alike for the verve, commitment and intelligence of his performances, Rupert Marshall-Luck appears as soloist and recitalist at major festivals and venues throughout the UK as well as in France, Germany, the Netherlands, the Republic of Ireland, Sweden, Switzerland and the USA. His extensive discography includes many World Première recordings as well as conspectuses of the complete music for violin and piano of Herbert Howells and C. Hubert H. Parry; and his solo performances have been frequently broadcast on BBC Radio 3, ABC Classic FM (Australia), RTÉ (Ireland), SABC (South Africa), Radio Suisse Romande (Switzerland), and in Canada, France, New Zealand and the USA. His recordings have attracted glowing critical acclaim from the international musical press, including BBC Music Magazine, Gramophone, International Record Review (“We have music of distinction and performances to match. 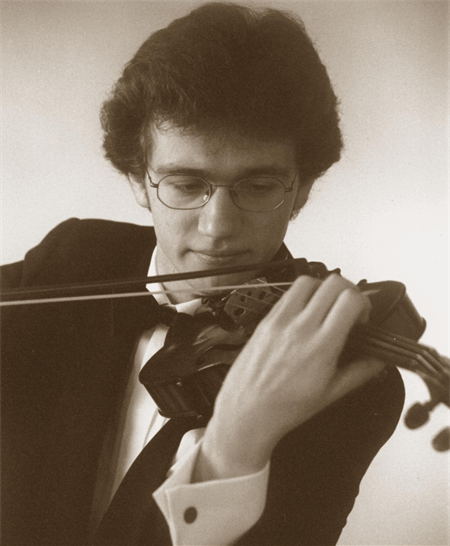 A decisive view of how the structures must knit together and considerable mental stamina from both players are firmly implanted into the performances”), MusicWeb International and The Strad (“Marshall-Luck is an ideal interpreter: generously but not effusively lyrical; agile and athletic”). A disc of John Pickard’s chamber music for Toccata Classics (TOCC 0150) was also praised by Fanfare, being highlighted as “a compact disc not to be missed”. He appears on a disc of new works with the BBC Concert Orchestra alongside the pianist David Owen Norris and the baritone Roderick Williams, and has recently released the works for solo violin and for violin and piano by Andrew Downes. The solo-violin music of Graham Whettam will be released later this year. Engagements for the 2018/19 season include a concert tour of South Africa, including recitals in Johannesburg and Pretoria; a recording of works for solo violin by contemporary Faroese composers; the world première performance of a new work for violin and piano by David Matthews; and performances and a recording with the German pianist Michael Korstick of works by the French-Israeli-British composer Nimrod Borenstein. As well as his busy schedule as a soloist and chamber musician, Rupert is active as a writer and speaker on the performing aspects of music, and he has presented lecture-recitals, seminars and masterclasses at the Universities of Bristol, Cambridge and Oxford; at Birmingham Conservatoire, the Royal Welsh College of Music and Drama, and the Royal Academy of Music; and at University College London. His radio broadcasts include several appearances on BBC Radio 3’s In Tune and a programme for Radio 4’s series Tales from the Stave. His article Volksmusik, Landschaften und Turbulenzen: Die Lieder und die Kammermusik von Vaughan Williams (Folktunes, Landscape and Turbulence: the Songs and Chamber Music of Vaughan Williams) was recently published in edition text + kritik (Richard Boorberg Verlag); and in 2019 he will give talks throughout the UK for various branches of the Elgar Society in which he will examine, compare and illustrate the violin writing of Edward Elgar and Hubert Parry. His scholarly-critical edition of Elgar’s Sonata for Violin and Piano, op.82, will shortly be published by G. Henle Verlag of Munich; this forms part of a series of editions for the publisher which together will comprise the complete violin music of Elgar.